Homer is where the heart is! We are thrilled to have Homer Farmers Market take over our Guest Instagram spot this week. If you’ve ever been to Alaska you know that its pristine beauty stretches from summits to shorelines. Via Sterling Highway, Homer, the “Halibut Capitol of the World”, is nestled in the Kenai Peninsula Borough with a population of 5,000. 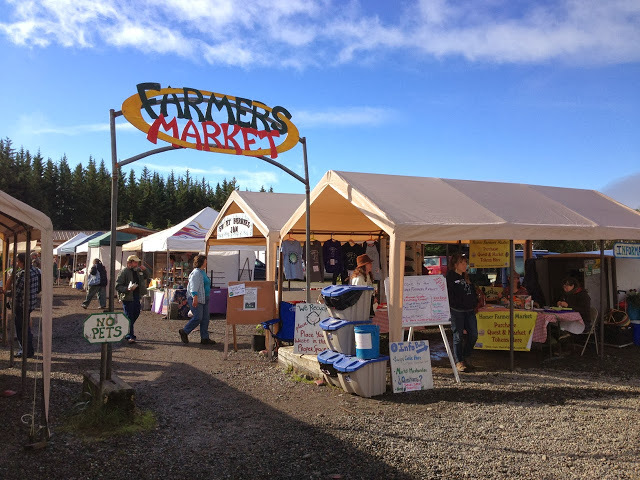 While tourists seek out activities like glacier skiing, kayak tours, trail hiking, and fishing- it’s the Homer Farmers Market where locals find community. Robbi Mixon, Market Director, describes the market as a true community gathering space- where folks spend hours sharing ideas, telling stories, and of course, enjoying local food. Mixon has been the Director for 6 seasons and grew up in Georgia, where she spent plenty of weekends with her grandma experiencing the unique cultural experience that farmers markets offer. The love and appreciation for farmers markets followed her to Alaska, where you can find her amongst the locals on market days, shopping and sipping from a cup of locally roasted coffee. The market began in 1999 and since established special events such as the Zucchini Festival and Harvest Party. Mixon especially loves the Harvest Party- a potluck held to thanks customers, rain or shine! The local bagel shop even got its start at the market, successfully selling their rolls and schmears in a brick and mortar business. The Homer Farmers Market accepts SNAP, WIC, Senior nutrition vouchers, and host a diversity of activities such as cooking demos, live music, a Community Garden and kids’ activities. The market has recently received an FMPP Grant from the USDA and was recognized by Daily Meal as a top 101 farmers markets in the nation. Learn a little bit more about Homer Farmers Market from our interview with Robbi and be sure to follow their story on Instagram. Farmers Market Coalition: Tell us about Homer Farmers Market. Robbi Mixon: We’re an outdoor market located in Homer, Alaska (population 5,000) and opened in 1999! Our market is truly a community gathering space- folks spend hours down at the market, sharing ideas, telling stories, and enjoying local food. We have one year-round, part-time employee (director), an EBT coordinator, and a market greeter. Volunteers help during special events like Zucchini Festival and the Harvest Party. We’re proud that our local bagel shop started at the farmers market as a food vendor, and then the next year opened a brick and mortar business. They’ve been growing their business ever since! FMC: Does Homer FM provide any special programming or activities for the community? RM: Yes, we do. We accept SNAP/WIC/Senior nutrition vouchers, and run several activities including cooking demos, live music, Zucchini Festival, Kids Activities, Community Garden, other demos like pressure gauge testing, Harvest Party, and a Turkey Raffle (that supports the market scholarship program). FMC: How do you spread the word about what’s going on at Homer FM? RM: We use Instagram, radio, newspaper, art/photo posters (contest yearly! ), rack cards, weekly news column, and Film Night promotion. Facebook has been huge for us! FMC: What are some of Homer FM’s challenges and successes? RM: SNAP participation has been a challenge. The state used to sponsor double days, but cut the program last year. Before that, we saw our SNAP participation building each year, but it’s now on the decline. However, we believe in food equity and will continue to support SNAP/EBT/WIC programs and work to grow participation. On a positive note, we were thrilled to receive an FMPP Grant from the USDA! We’ll be hosting a state-wide conference of market managers and board members in early 2017! FMC: What’s special about Homer FM? RM: Our heart is LOCAL. We believe in supporting small business and local agriculture. We believe in education opportunities for young and old alike. We believe in food equity. And we believe in community building.